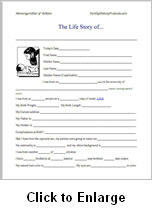 Easily Recall, Document and Preserve a Lifetime of Memories with This Fun-to-Fill-Out, Downloadable, Fill-in-the-Blank Autobiographical Workbook! Treat This Workbook Like Someone You Just Met..."Tell It" All About Yourself! Memorygrabber is a 321 page downloadable life story workbook. It is ideal for writing an autobiography or for getting an aging parent or grandparent to finally open up and get those cherished family stories preserved for the ages. ...and the responses that come about because of that digging, will generate the most valuable gift that you could ever give your kids and grand kids. It will be the gift of knowing about your life, their family history and their heritage. Memorygrabber downloads as a PDF-formatted e-book. An e-book is simply a downloadable "book" and is read using any free PDF reader, such as the Adobe Reader. (NOTE: Additional function, such as being able to type and save one's answers directly onto the Memorygrabber pages can be had by using the free FoxIt PDF Reader. More information on this is below. FoxIt currently works only with a PC and Apple Ipads). Memorygrabber uses memory-stimulating questions, activities and exercises to "Mine Your Memories" and to help you recall events, people, places and more! I think that you'll be surprised at all that you've forgotten over the years. Besides it being a wonderful journey down memory lane for you... Memorygrabber will supercharge your memory, causing a wonderful recollection of stories and experiences from your life. Of course, it will also help you organize and preserve the memories that you still cherish and have on the forefront of your memory. I'm not a memory specialist, but who I am is a person that is very passionate about you leaving more than a mere obituary behind, when your days in this life are over. Your story and life experiences are, by far, more valuable than anything else that you will leave your kids and grand kids. .... but won't think to ask until it's too late! For You, Memorygrabber Will Be a Wonderful Trip Down Memory Lane. For Your Kids, it Will Be a Life Changer! As a child I can't remember a time that my grandmother didn't include a few photo-copied journal entries in with my regular Christmas present. She was always good about keeping a journal about her life, but these journal excerpts were those kept by her parents, grandparents, great grandparents and then even her great-great grandfather. She'd usually included only about 20-30 pages each year. 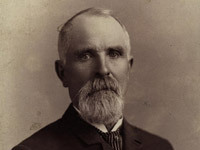 The oldest journal/life history that she has in her possession is that of her great-great grandfather John Murdock. He was born in the 1790s. On Christmas afternoons, during my later teen years, you would have found me with my nose stuck in those pages. ...but all I really remember now are the stories contained in those journals and writings. These kind of things have real value and they are still a treasure to me and my family today! Everyone has a story to tell and every family deserves to know a little about from whom they descend. My hope is that this workbook, after the many hours that I've put into it, will inspire you and help you to tell the story of your life ....a story that no one else in the entire world is more qualified to tell than you! ...they don't often do anything to preserve those stories. I've met people who have told me stories of fascinating things that they've done and exciting places that they traveled to. These were stories that really gave me an insight as to who that person was and what made them the person that they presently were. "Have you written any of those stories down for you kids"? ...and so on and so on! One thing I can tell you, for sure, is that when my ancestor John Murdock wrote what he did, he didn't have the benefit of spell check like we do today! And yes, sometimes that fact is obvious in his writing. But who really cares. I'm very glad that that didn't stop him from writing what he did. After realizing that the above was common of most people, I began thinking of how I could help people overcome the concerns they typically would have about writing their autobiography or lifestory. I just wanted them to actually get started and, in the end, have something in hand...that could be passed on to posterity! Anything is better than nothing! I had always been a fan of memory prompt books that I'd find in bookstores. These books had some questions followed with lots of space for you to write in the answer to each question. Eventually they'd get a little boring, so I set out to improve upon those and to come up with a "Mega" memory prompt book! Memorygrabber is the result of that work! 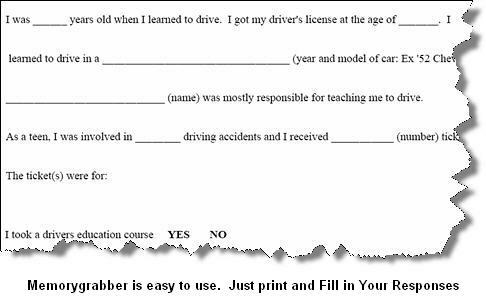 "My earliest recollection of my father is...." or "The oldest relative that I can remember, as a child, was..." are examples of completing the sentence excercises that you will find in the Memorygrabber workbook. These questions are simple yet powerful. Given the choice of a blank tablet or a fill-in-the-blank workbook, most people will choose the fill-in-the-blank method to write about events from their lives. It is easier because it takes the pressure off of having to decide what to write about and it doesn't require great spelling and grammar skills. It will lead you from topic to topic, one page after another! Use locations from your past such as your childhood home, newlywed home, your first grade classroom or your old neighborhood to recall memories! Dad usually sat in the chair "over there"
Treat it as if you were giving someone a tour of places from your past. A lot can be said with a simple yes or no answer. Then stories about why you are the way that you are can be shared. "I am frugal with my money"
and many others are but a few examples. There are 7 pages of yes or no questions in Memorygrabber. ...your birth, birth of siblings, marriage, births of your children, anniversaries, job changes, started school and more. List all kinds of things from your favorite ways to relax on a lazy Sunday afternoon to first-time experiences such as your first kiss and your first airplane ride! "Calendar dates that have special meaning to you" and many more! The real "GOLD", of course, lies in the stories that these lists will trigger! Your past is important, but that is only one part of the "total package" that Memorygrabber seeks to help you capture! There are other areas that complete the story of your life! "This is what I've done with my life so far..."
"This is what I'm doing now..."
"This is what I think and believe about certain issues..."
"These are the world events that shaped my life and generation..."
"This is what I hope and plan for the future..."
"These are the people (friends and family) that have impacted and continue to have influence in my life"
This kind of thing really amazes me! All the data in your memory banks could probably fill an entire library! Seriously, if you were to have everything that is stored in your memory put down on paper, including everything you've learned, heard, seen, done, experienced etc ... you'd have a whole library on your hands. I think it amazing how a mere mention of a name from your past, a sudden scent of perfume or a glance at a photo you hadn't seen for many years can suddenly trigger a dormant memory from a long time ago! How does the the human mind do that? Would that memory have ever resurfaced if not for the outside stimulation? I can't say for sure, but I do know that our memories sometimes need a catalyst or a spark....a trigger! Memorygrabber provides that spark and it will be the catalyst for you to go in and "Mine or Memories." 2. 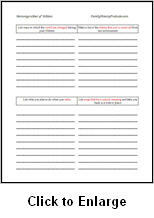 Print out the pages, place them into a 3-ring binder of your choosing, then write in your answers and responses by hand. 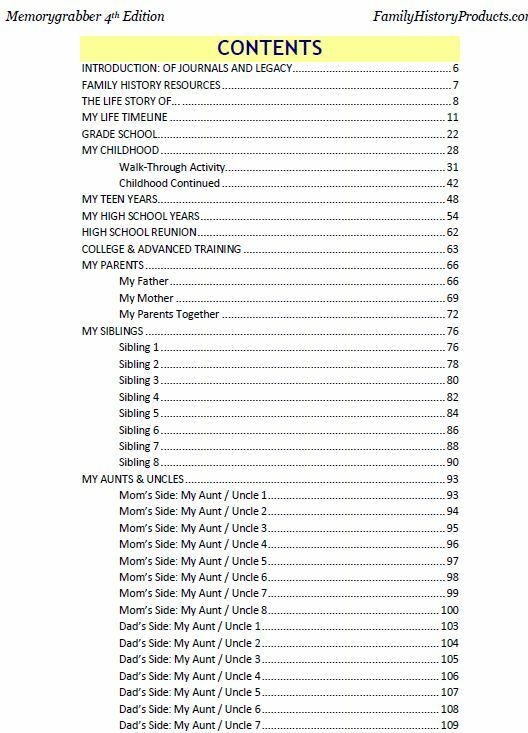 A very souped-up journal and/or autobiography template, if you will. 3. If you keep a journal, Memorygrabber will help you take your journal writing to another level with hundreds of new ideas for journaling topics. Here's my top recommendation for journal software. A special add-on module of Memorygrabber has been added to journal software, making it easy to expound on your stories, add photos etc. 5. Get a copy into the hands of an aging parent or grandparent and see what kind of conversation ensues. It will be fun and will become some of the most precious time you've ever spent together. No, Memorygrabber is an e-book published in a PDF format. It is viewed by using a PDF reader such as the Adobe Reader. The Foxit PDF Reader adds the ability to type your answers and responses right into the PDF file. Yes, it is now possible. This is relatively new technology. Memorygrabber is being used in homes and schools around the world, from New Zealand to Ireland. It was used in the classroom at Duke University in 2003 in instructor Cynthia Clark's family history class! Used by a counselor, associated with the Veteran's Administration (VA), to help soldiers suffering from Post Traumatic Stress to remember that "they are more than their trauma"
Some grade school teachers have asked to use portions of Memorygrabber in their classrooms! A graduate student, Jennifer Nance, at the University of Central Oklahoma used Memorygrabber to help design a life history program while pursuing her Master's Degree of Gerontology. Local supervisor, Karen Krebs, of the Idaho State Child Protective Services to to "facilitate the creation of "family life story notebooks" for our biological families - pages that the parents and children can complete while they're having parent/child visits at our office and can continue to build on once the children are returned home - or given to the adoptive families if the children are not able to return home." Do you believe any of these excuses? That You Have to Be a Great Writer to Write Your Lifestory? Memorygrabber takes this one away because it is, in large part, a fill-in-the-blank workbook. There are parts that are just like filling out a job application. Anyone can fill out an application, right? From there add one or two sentences to convey an experience or a memory. Some of the workbook is as easy as answering yes or no! Write as little or as much as you wish. Something is better than nothing! That It Isn't That Important to Write Your Lifestory? This one has been covered on this page already, but if you still believe this, do it anyway and let your kids and grandkids make that decision. I think you'll find that they'll disagree with you! That Your Life Has Not Been All That Special, Enogh to Write About? If you still believe this after giving Memorygrabber a legitimate try, contact me and I'll refund your money...but I'll be shaking my head in disbelief! That You Wouldn't Know Where to Start? That Autobiographies and Life Stories are Only for Celebrities? All of the above assumptions are simply not true! A Blank Piece of Paper or Fill-in-the-Blank Questionaire Format ... Which Would Most Prefer? If you gave a person a blank piece of paper and told them to start writing about their life, chance are they wouldn't get far and they wouldn't enjoy the challenge! Give them a fun, fill-in-the-blank bio to fill out and the result will be very different....it would probably be hard to get them to stop, because most would consider it fun! 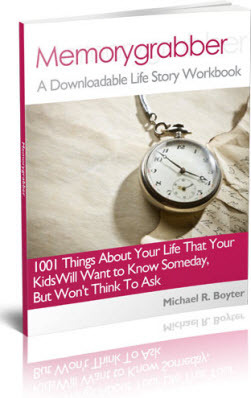 Get a Copy of this Workbook into the Hands of an Aging Parent or Grandparent! Memorygrabber is a great conversation starter... especially with parents and grandparents that are sometimes reluctant to talk. Sometimes we just have to take the initiative to start the conversation with our aging family members. I realize that not all of our elders think like this, but I think most do...to some degree or other. Get a copy of Memorygrabber and take it over on your next visit to see your mother, father or aging grandparent. ...Or take a copy to the next family reunion and see what conversations and wonderful memories you can stir up! Memorygrabber is one the greatest investments you ever make....and at such a low price, it seems a "no-brainer" to most! Once you are satisfied with all of the stories and information contained in within your life story document, you will be able to send copies of it to whomever you wish and thus insure that someone will always have a copy of it....it will never be lost. I personally guarantee your satisfaction with Memorygrabber. If for any reason, you believe that this workbook will not be of benefit to you and your family, just ask for a full refund. I will process that refund within minutes of receiving your refund request. This is my promise to you. If you have questions about Memorygrabber, please contact me and I will get an answer to you just as quick as possible. NEW! Memorygrabber is available in a British English version. This version reflects British spellings, wording/expressions,etc. Apartment = flat, diaper = nappy, realize = realise, and so on. You'll be given the option to download either version, on the download page. Promote Memorygrabber and earn. Learn more. Used by a counselor, associated with the Veteran's Administration (VA), to help soldiers suffering from Post Traumatic Stress to remind them that "they are more than their trauma"
Several grade school teachers have asked to use portions of Memorygrabber in their classrooms! Local supervisor, Karen Krebs, of the Idaho State Child Protective Services to "facilitate the creation of "family life story notebooks" for our biological families - pages that the parents and children can complete while they're having parent/child visits at our office and can continue to build on once the children are returned home - or given to the adoptive families if the children are not able to return home." "A Valuable Piece of Work"
"(Memorygrabber)...it's a valuable piece of work!....I can imagine the time and thought you spent developing it. It shows!" "There's no excuse now for ANYONE to say their life story can't be written. You've eliminated all the excuses." "After buying your first Memorygrabber, I wrote an 85 page story of my life, my 75 years." "After going through your new (version), I know I can and will fill in at least another 100 pages." Thank you for having the wonderful idea for all the work that you have done. I don't know much about my family and I have struggled with that my entire life. Now that I am 35, I am just starting to ask questions. However, it's too late to ask my grandparents. My parents never asked either. I want my children to know as much as they possibly can. Thank you again and keep up the great work. -- Cecelia A. "Now I Have ... More Focus"
"The task just seemed far too overwhelming before. Now I seem to have more of a direction and also I am more easily focused (with MemoryGrabber)"
"I would strongly recommend (Memorygrabber). It really is the most useful tool I've come across. There are some really neat links, too, for remembering stuff in certain decades, fads, styles, etc. Made my head spin!" "From All of us at Sol Amor Hospice We Just Wanted to say THANK YOU!" "Michael, We are working on a new program and we will be doing life reviews on all of our patients. From all of us at Sol Amor Hospice we just wanted to say THANK YOU!!!! We ... love the (downloaded) book (Memorygrabber) and our patients will too!" "I'm Amazed by all You've Included"
"I am a graduate student at the University of Central Oklahoma, working to complete my Master’s of Gerontology. For my final project I am designing a life history program to be conducted, by myself, at our local senior center. Your passion is evident in your product. Thank you for allowing it to be a part of my program. "One of the Best Things that I Have Ever Come Across!" I am looking forward to working on this long project and I am looking forward to finishing it to share it with the family. I have 14 nieces and nephews and I am glad that I will be able to share my life experiences with them as they get older. Memorygrabber has just been one of the best things that I have ever come across! Thank you so much for your support and efforts to make my life story a success!! Take care and I will keep you updated on my progress. "MIchael, Thank you so much for this program. I'm going to use, use and use this! You are an angel!" "Capable of Sparking so Many Memories"
"I have seen different books in the libraries, but never one that is this easy and is capable of sparking so many memories that otherwise you never would think of...to come up with such an incredible how-to book is amazing!" "I've always wanted to do this (write my life story), but was overwhelmed and didn't know how to start." "It's well organized, colorful and fun to do...a great combination! It makes writing family history user-friendly." 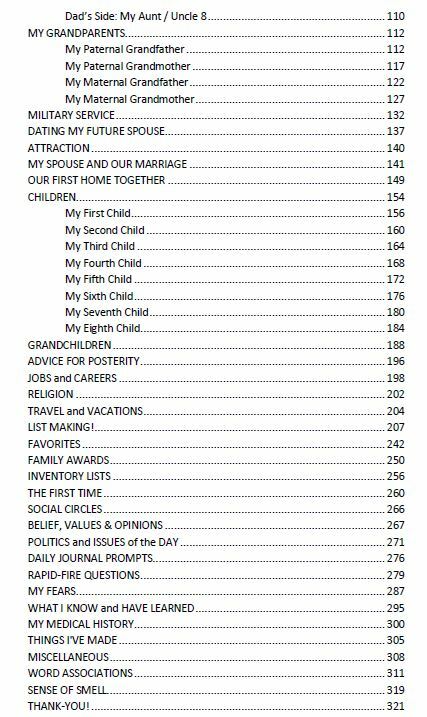 I just wanted to let you know instead of taking my Sunday nap today, I opened up Memorygrabber and spent over an hour filling in blanks about my life. Wow, that gets addicting, but fun!